Sa Caleta is a quaint resort with a picturesque sandy cove, and a small selection of shops and bars. A larger selection of eateries and bars can be found in Ciutadella or the larger resorts of Cala Blanca and Calan Bosch which are all within a 5-10 minute drive. Sandandria is a pretty Blue Flag Beach further along the coast from Sa Caleta with white sands that slope into warm, clear waters. Sa Caleta is a quaint resort with a picturesque sandy cove, a couple of shops and a bar. 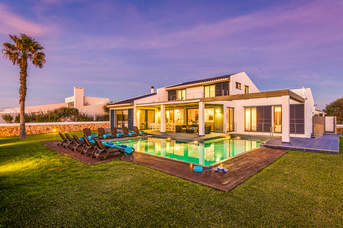 A larger selection of eateries and bars can be found in Ciutadella or the larger resorts of Cala Blanca and Calan Bosch which are all within a 5-10 minute drive. Sandandria is a pretty Blue Flag Beach further along the coast from Sa Caleta with white sands that slope into warm, clear waters. The area has a small bar and restaurant serving local food. Nearby Santandria is particularly pretty with some restaurants perched on the rocks overlooking the sea. Head into Ciutadella to the many tapas bars and fish restaurants which line the pleasant harbour. Sa Caleta has a beautiful cove, an inlet that offers good snorkelling opportunities from the rocky entrance. The cove is accessed by steps and, in high season, has a rustic beach bar selling drinks and snacks. Just around the coastline and a short walk is Santandria another stunning cove with restaurants and bars, white sand and clear waters. Son Blanc? In nearby Calan Bosch you will find “Aquarock” open in the high season this waterpark offers fun for all the family. 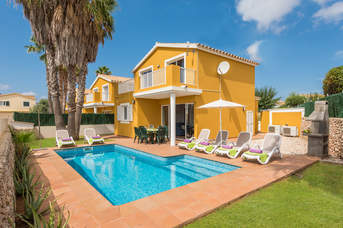 Children will love the popular Lloc de Menorca in the centre of the island and there is also the Castillo Menorca, 15 minutes’ drive east of Ciutadella, which has a go karting track, outside adventure park and retail outlet. For those that enjoy walking, take the coastal path and head into the atmospheric old capital of Ciutadella approx. 1½ miles away. In the evenings witness the spectacular sunsets with a wine /beer in hand from one of the bars of the area. Nearby Calan Bosch has a lively marina. Take a boat trip to the secluded beaches of the area, or sit and have a meal whilst watching the activities in the bustling marina.